I’ve done one half Marathon and have five more planned this year. At what point are you a marathoner? When you do a full? Technically, yes … you can’t call yourself a marathoner unless you’ve done the full 26.2. I’ve done a lot of halfs but … I don’t consider myself a marathoner. Distance runner, yes. Half marathoner, yes. Marathoner, no. When people say stuff like “I can’t believe you run marathons!” … I’m quick to correct them. I don’t take that credit. My family think any run is a marathon, 5k 10k etc. I’ve tried explaining 1000 times! Yes. A full. Right now I’m a half marathoner. Yep…after you run a full. You are still the man, as 13.1 is no joke, but you’re a marathoner when you run a full. 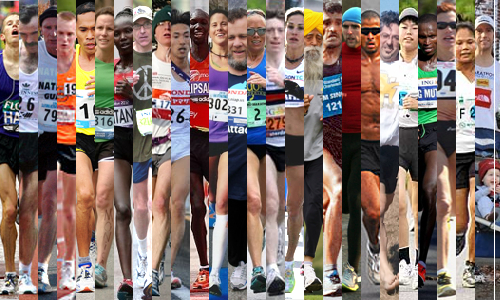 I did a marathon back in 1986, and since have ran only half marathons, many of them…….I do not consider myself a marathoner, but my marathoner friends strongly differ with me on the issue and say that I did the distance once, so I am a marathoner…..what do they know ??? I have the 13.1 sticker on my vehicle, and wouldn’t feel right with the 26.2 !! Proud to be a half-assed runner !!!! I agree … I think that you have to do something more than once to really earn that badge. When you crossed that finish line of your first half!!!!!! Isn’t it a great feeling? Congrats marathoner! Actually, when people say, “You’re a marathoner, right?” I usually say, “I’ve run one, but I run other distances too.” In my mind though, I consider myself a marathoner because I know I plan to do more. To the world though…I’m somewhat humble. Also, I’ve found that although folks are impressed by the fact that I’ve run a marathon, many think that’s unattainable…I like to talk about other distances and the fact that I didn’t start out running marathons, so non-runners know there is more to it than 26.2. I am having to correct people ALL the time when I get introduced as the running friend who runs marathons. No, no desire, I just do 1/2 ones thank you! But it is nice to get introduced as the crazy girl who runs a lot. And I don’t think I run that lot. I believe putting in the time and effort and running your first half earns you the right. Sweat, hard work and dedication comes in all forms that’s why they still call a half a marathon. I also consider myself a tri athlete. I have only done sprint tris, and have NO desire to do full ones, but it is all the same, just the distance. I do a 26.2 I don’t consider myself a marathoner. I am a half marathoner. Done 6 of them. So if 13.1 is a half marathon, why do we not refer to a 10k as a fourth marathon etc. Are those who run marathons any better than those who focus on a mile? Accept what you have accomplished, focus on your goals. A runner is a runner is a runner! A mile is a mile is a mile. Feel accomplished having run all the marathon fractions and know they are accomplishments in and of themselves. Similar question: at what point do u think you’re ready to do a full? How many halves? Training run distances? When do u take the leap and sign up for your first full? I love doing halves. Want to do a full at least once. Was training for a full last summer until surgery put a damper on it. If you’ve ran a half, you can prob train for a full. Just 5-6 months of training from half to full. Most training programs start between 5-7 mile long runs. I’m with you, I am not quite ready to tackle a full, I have completed 2 halts, and have 3 more planned. Maybe next year. What App Do You Use to Track Your Run?